In 1983, Paul Mockapetris proposed a distributed database of internet name and address pairs, now known as the Domain Name System (DNS). This is essentially a distributed “phone book” linking a domain’s name to its address, allowing you to type in something like todayifoundout.com instead of the IP address of the website. The distributed version of this system allowed for a decentralized approach to this “phone book.” Previous to this, a central HOSTS.TXT file was maintained at Stanford Research Institute that then could be downloaded and used by other systems. Even by 1983, this was becoming a problem to maintain, which ultimately led to the Domain Name System. Companies in the early 1990s were often so ignorant of the internet as a whole, let alone its potential as a tool for advertising, sales and PR, that in the latter days of 1993 about half of all Fortune 500 companies had failed to even register their own name online. 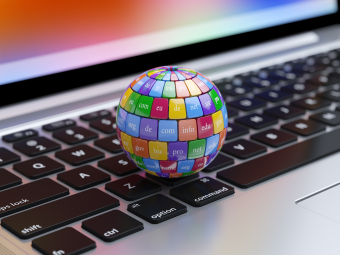 In fact, in October of 1993 there were only about 200 World Wide Web servers online, though other protocols for dealing with files on the internet, like Gopher and Wide Area Information Servers (WAIS) were relatively prevalent. Companies started to cotton on to the value of domain names and the internet in the latter days of 1994 when a writer for Wired magazine called Joshua Quittner registered McDonalds.com and, in a fascinating time capsule of an article, jokingly mentioned he might try to sell McDonalds.com to Burger King. While many companies were certainly more aware of the value of domains after this exposé, examples of domain grabbing and corporate blundering continued to occur for many years afterwards, surprisingly, even by tech giants of the age. This brings us to Windows2000.com. This was initially registered in 1996 by our hero of the hour, Bob Kerstein, who also at one time or another owned broadband.com, dividend.com, englishman.com, and streetmap.com, among numerous other prime domains. To quote Kerstein himself, he intended Windows2000.com to be a “window to the world” and he stuffed it full of links to live camera feeds of various locations around the globe. Things changed in 1998 when Microsoft announced that their latest incarnation of their operating system was going to be called Windows 2000, not having bothered to actually look up if the domain was available or if the name was already trademarked. All of my friends told me I should sue them. In fact, I had several lawyers contact me to ask if they could represent me. I turned them all down, though. I’m not a litigious person and I wasn’t interested in the uphill battle that would be suing Microsoft. I was able to get in touch with someone at Microsoft and we basically agreed to not sue each other. At the time, I formed an agreement with Microsoft. They used some of my content on their sites to help build their content brand. In exchange, they put a link back to my site that said “Windows 2000™”– my trademark. However, Microsoft’s choice of name of their OS got Kerstein thinking and he soon realised his website was going to be, as he put it, “next to worthless” after the year 2000, but at present had great value to a certain multi-billion dollar company. Seeing an opportunity, he put the word out that he was looking to sell the domain. Naturally, Kerstein first let Microsoft know of his plans. Not long after, he got a call back informing him that Microsoft was willing to make a generous offer to purchase the domain. As per the agreement Kerstein signed with Microsoft, he’s not allowed to reveal what they paid him for Windows2000.com, but he has noted that “It was good, but not life changing” in interviews. Before signing the deal though, Kerstein, keen to take advantage of the once-in-a-lifetime opportunity of having a multi-billion dollar company against the wall, took a browse through the domain names Microsoft owned. This is when he noticed that they just so happened to own Bob.com. For anyone curious why Microsoft owned Bob.com, this was registered as part of an ill-fated multimedia campaign to promote an almost historically unsuccessful piece of software called Microsoft Bob. The software initially was conceived as a “more user friendly interface” to supplant the normal Windows Program Manager for novice users. 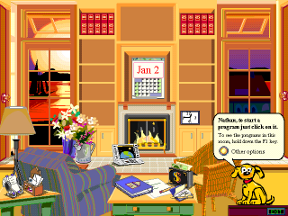 In essence, Microsoft Bob’s interface comprised of a virtual house with various rooms and items in the house which could be clicked on with different objects corresponding to certain applications. For instance, if you clicked on a calendar in the room, the calendar application would open; click on a pen and paper and a word processor opens up. Needless to say, Microsoft Bob was a catastrophic failure and within only a half year of its debut was discontinued. PC World Magazine later named it the 7th worst tech product of all time and CNET went so far as to dub it the worst product of the 1990s. But Microsoft Bob’s influence didn’t stop here. The oft’ lamented Comic Sans font was created as a direct result of Bob. Microsoft designer Vincent Connare saw a beta of Bob, which used Times New Roman in speech bubbles. Not liking this at all, he was inspired to come up with a new font for Bob, drawing from lettering in the comics The Dark Knight Returns and Watchmen which he had in his office at the time. Comic Sans wasn’t finished in time for Microsoft Bob’s release, but it soon found its way into other Microsoft products, much to the chagrin of many. In any event, as Microsoft wasn’t using Bob.com anymore and Kerstein’s first name is Bob, he told them that he’d happily sell Windows2000.com to them if, along with the agreed upon funds and a few other minor stipulations, they gave him Bob.com. They accepted. As for Windows2000.com, it’s no longer active (other than showing an ad-based landing page) and, according to who.is, the domain itself doesn’t appear to be owned by Microsoft anymore. © 1996 – 2018 Bob.com, Scripophily .com ® LLC, Scripophily.net, Old Stock Exchange, Professional Stock Traders Association, PSTA.COM , EBITDA .COM, RM Smythe, Wall Street History. All Rights Reserved. You may link to the site, but do not copy any images or information without our expressed written permission. Thank you!